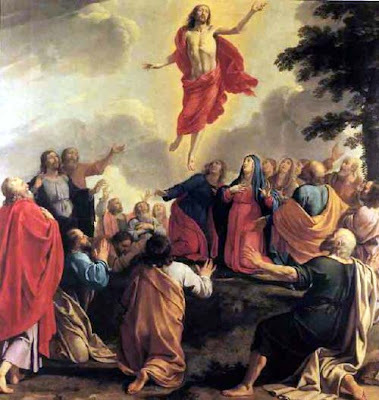 The Ascension is the grand finale, when Jesus, having completed His mission of salvation, returns to the Father in Heaven. The problem is that it is very hard to imagine the circumstances of the Ascension. It is easy enough to imagine the manner of Christ’s coming into the world – His birth in the stable of Bethlehem and the adoration of the angels, shepherds and wise men – but the manner of His departure fills us with many questions. Most paintings show the Ascending Christ being propelled up towards Heaven, rather like a rocket lifting off into space. In some churches in the past today’s Feast saw the elaborate ascension of a statue of the Risen Christ right up into the roof of the church, and sometimes a parallel descent into the ground of a figure of the devil. But we shouldn’t imagine the Lord hurtling through the stratosphere or start wondering how many light years it took Him to reach Heaven! When we talk of ‘Ascension’ we are using human language where human language doesn’t really apply. Indeed the Gospels speak of the Lord’s disappearing beneath a cloud, which in the Bible is always a sign of the mystery and majesty of God. For thirty-three years the Word was made flesh, the invisible God made visible. Now He becomes invisible once again in the cloud and God’s definitive Revelation has ended. There is a pious tradition that the Ascension of the Lord took place at midday. The symbolism behind this is very powerful. After all, He is thought to have been born at midnight, at an hour when the world covered in darkness – for Jesus came into a world darkened by sin and showed us the way back to the Light. He ascended at midday, the hour when the sun is at its strongest – for Jesus, the ‘Sun of Justice,’ has now conquered death and given us new life. And yet His light does not disappear with the Ascension; the disciples are not suddenly shrouded in darkness. No, Christ has given His light to the Church, to His followers, until He comes again. The Ascension passes Christ’s mission on to us: ‘Go, therefore, make disciples of all the nations,’ we hear in St Matthew’s Gospel, ‘baptize them in the name of the Father and of the Son and of the Holy Spirit.’ We are to become His hands and feet, His eyes and ears, His lips and tongue, and we are assured of His abiding presence with us, to the end of time. Christ is with us in the words of Scripture and in the teachings and guidance of the Church; Christ is with us most particularly in the Blessed Sacrament that we find in every church; Christ is with us in our brothers and sisters and especially in those who are most vulnerable – the unborn, the sick and the needy; Christ is with us in ourselves, thanks to our Baptism and the work of the Holy Spirit, and in the everyday situations that challenge us to put our faith into action. The Ascension, then, is not a feast of God’s absence but a feast of God’s presence. Alleluia! You'll probably have seen the communiqué on the fssp website about the Novena for the faithful in China, 16-24 May 2008. It would be an excellent thing to encourage. The American liturgical theologian Nathan Mitchell has made some very interesting comments about "the presence of the absence" of God in the liturgy in his book Meeting Mystery (Orbis, 2006).